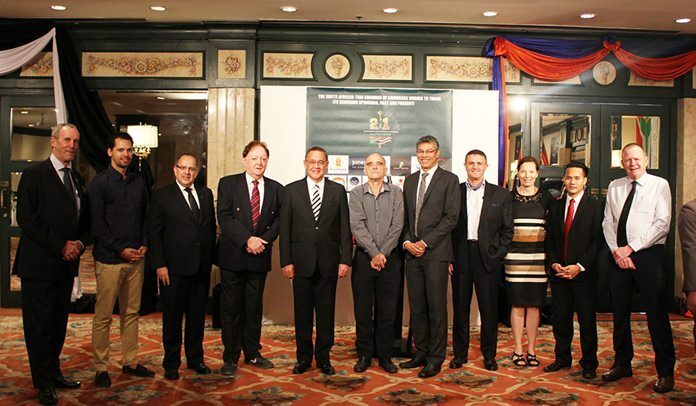 The South African Thai Chamber of Commerce Thailand recently held their AGM at the Rembrandt hotel in Bangkok where the committee for the next two years was elected. The event was also attended by the new South African Ambassador to Thailand, Myanmar, Laos & Cambodia, His Excellency Geoff Doidge. Pictured left to right: Simon Davies, Tauriq Brown, Wim Fagel, Allan Riddell, His Excellency Ambassador Doidge, Tom Bishop, Chairman Ragil Ratnam, Paul Pavlides, Linda Reay, Pasit Foobunma, and Peter Taylor.